Lately I have been a little inconsistent with my plans, I buy products to make a particular dish I have in mind, then I do something completely different with it. I wanted to make some asparagus mousse for canapé with salmon and here they show up with spaghetti. Don’t you love the green all over the picture? If you don’t like asparagus, forget this recipe. I certainly do lack photographic skills but I think it really looks as green as you see it. Asparagus have a very subtle flavor and when they are served in a creamy sauce, their flavor is decupled, I did not add any cream but you could add some, it will make the texture even more velvety. There is nothing interesting behind this dish other than it was created one day while I was thinking about how to make some of my clients eat more vegetable in a way that it was not “obvious”. Some people would tell you, “Oh yeah we loooove vegetables!”, then after a while, you realize that they just hate vegetables if they look like a “vegetable” and they need to be hidden in something that has a different shape and mixed with a bunch of other ingredients, do you know what I mean? Anyway, people eat what they like and the way they like it, and I am certainly not the one to judge people’s diets nor tastes…and just because I love that expression, I will say “It is what it is”. Just love to say this even if it doesn’t mean much when you think about it. It’s like stating the obvious. One serving of these spaghetti makes you consume 1/2 bunch asparagus, which is not bad. In France, I used to grow up eating salsifis (in English, oyster vegetable or salsifis I think). It’s white and long and looks like a white asparagus but it’s not. Also white asparagus are more popular over there. The white asparagus is an asparagus that grew in the ground without any light, so its flavor is very delicate. The purple asparagus is a white asparagus whose tip has grown above the ground, so it has a fruity flavor but a slightly bitter taste at light exposure. The green kind has been grown outside at full light so its green color is the natural process of its growth at sun exposure, and it’s the only asparagus that does not need to be peeled. Heat olive oil in a pan, add shallots, stir and let them cook for about 5 min, then add garlic and stir again. Cut asparagus in 2 inch pieces and add to the pan. Let cook for about 5-10 minutes, then add broth, salt and pepper. Cover and cook until the asparagus are cooked and tender. Mix in a blender and put back in the pan. If the consistency is too thick, add broth. You will add cream at this point if you want to. Mix the cream and let it cook for another 4-5 minutes. Cook spaghetti al dente, drain and add to the asparagus cream. Divide spaghetti onto plates and add goat cheese on top and fresh pepper if you like it. Serve very hot. This entry was posted by silvia on September 16, 2009 at 11:38 pm, and is filed under Pasta, Vegetarian - dairy. Follow any responses to this post through RSS 2.0.You can leave a response or trackback from your own site. Lovely pasta. I’m with you. I could plan a dish and do a different one the following day. 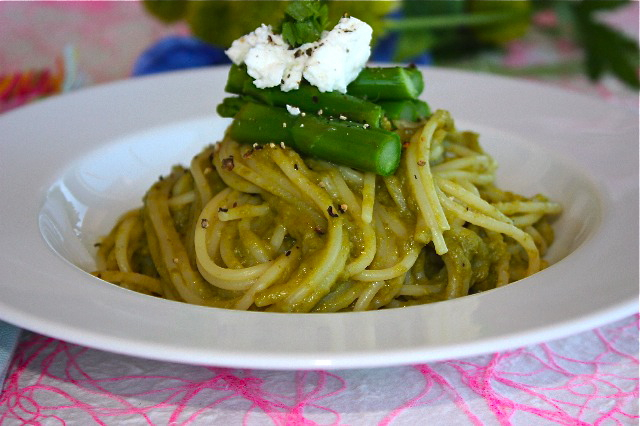 I love asparagus and goat cheese and this pasta is simple irresistible. Simply delicious ! Thank you for sharing. Cheers ! Beautiful! I would love this meal. I use hearty pastas and know the asparagus would stand up well. This is so pretty! It’s funny what you said about your clients – it’s like they’re little children and you have to hide the vegetables so they don’t know! what a pretty dish, I love how simple it is but yet it’s comforting! This looks so delicious. I love asparagus and I am always looking for new ideas. I like to hide veggies also, I commonly put butternut squash puree in mac and cheese, can’t taste it but it’s there!! I know exactly what you mean about using ingredients differently from what was originally intended. But I love the result and if this is really how they like to roll on Mars for meals, then sign me upon the next space mission for dinner! I love that dish. J’aime vraiment les asperges. Tellement délicieux. Bonne journée. This looks so amazing! I really love your blog – the photos, stories and recipes are really wonderful. I want to make every single thing you post! Sounds delicious! I’ll try to make this dish this weekend! This looks amazing. Something my fiance would love as well. Yum!